I experienced the 1968 riots in Washington, DC up close and personal as a Roving Leader for the DC Recreation Department’s Youth Gang Task Force. The riots in Ferguson, Missouri brought back bad memories. On the mean streets in the U Street NW corridor during the riots my co-worker and former Green Bay Packer great Willie Wood and I teamed up with the late U. S. Marshall in Charge, Luke C. Moore. Luke was appointed by President Lyndon B. Johnson. He was the first black in modern day history to head the U. S. Marshall Service in America. The three of us walked arm and arm through the tear gas streets of NW DC trying to maintain peace. Luke would go on to become a DC Superior judge and Willie Wood would be inducted in the NFL Hall of Fame in 1989. 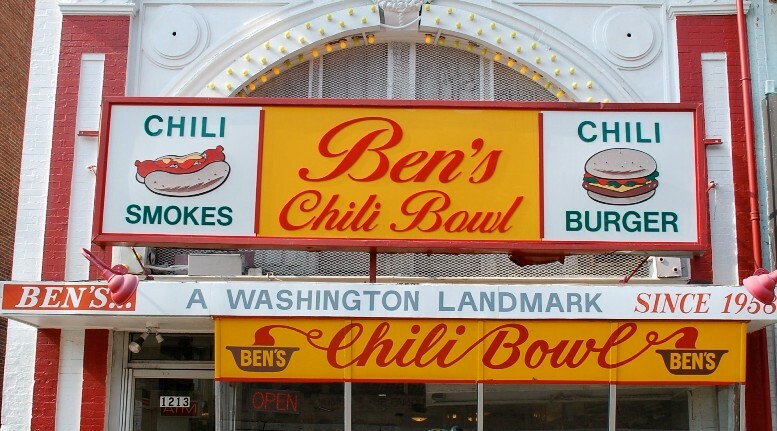 When President Lyndon Johnson ordered all businesses to shut down during the riots it was Luke Moore who called the White House and asked the President to reconsider and allow Ben’s Chili Bowl to remain open for first responders. Request granted—when the dust, tear gas and military personnel had cleared the streets, Lee’s Flower Shop, Industrial Bank, and Ben’s Chili Bowl were the only black businesses still standing. Luke Moore’s contributions to Kids In Trouble and Inside Sports can never be measured in time or money. He helped me get the Bolling Boys Base for juvenile delinquents off the ground on Bolling Air Force Base in SE DC. He went directly to DC Mayor Walter Washington and Department of Human Resources Director, Joe Yeldell and said “Let’s do it!” The longevity of the Kids In Trouble Christmas Toy Party (1968-2013) can be directly attributed to him. Luke encouraged other judges to get involved in the community including, Chief Judge Harold Greene with the opening of Bolling Boys Base. The athletes, politicians, radio and television personalities would all follow his lead when it came to community involvement. We had a great crew of judges from the DC Superior Court where the perquisite was fairness for all. They included “the one of a kind” Harry T. Alexander, Chief Judge Greene, Chief Judge Eugene Hamilton, Chief Judge Ted Newman, and Henry Kennedy Jr. The community and children were really first and they led by example. The riots in Ferguson made me remember that there was once equal justice for all in the DC Superior in the Nation’s Capital. A white cop would dare not show up in Judge Harry Alexander’s courtroom and not properly address a black defendant as Mr. or Ms. Judge Moore demanded the same type of respect for minorities from lawyers and cops with attitudes. Somewhere along the way I lost Federal Judge Alex Williams when he received his Federal Judgeship for the state of Maryland. In a recent interview the Chief of the Prince George’s County Police Department said, “Ferguson would never happen in Prince George’s County!” Are you kidding me? When it comes to police brutality in America Prince George’s County is second only to the LAPD in California (remember Rodney King). The PG County Police Department was monitored by the FBI for over 2 decades as it relates to police brutality. Have we forgotten that a young Afro-American man was recently found hung by his neck in a jail cell in Upper Marlboro, MD? He was waiting to be tried on the hit and run death of a white PG County police officer. He was the victim of police vigilante justice, here and now in the 21st century. The renegade cops were never brought to trial. A black correctional officer was paid off and took the fall for the renegade white cops who are still in uniform patrolling our streets. A black Federal Judge Alex Williams had an opportunity to say “Enough is enough” but instead of sending a message he sentence the correctional officer to 1 to 3 years. The sentence condones the department’s outrageous behavior. If this would have been the former black Prince Georges County Judge William Missouri, I would have said “Business as usual.” Missouri was known as “The Hanging Judge” when came to sentencing black folks, this made him a hero in “The Plantation” style halls of the Prince Georges County Court House. Thanks to Alex Williams and Bill Missouri the KKK is still alive and well in the PG County Police Department. Let’s not forget there was the unarmed black teenager Trayvon Martin walking through a white neighborhood shot to death, or the black teenager Jordan Davis shot to death in a Florida parking lot for playing his music too loud, a black man strangled to death on a NY Street in broad daylight for selling loose cigarettes, a black female college professor is dragged across street by her hair for jay walking, a white California State Trooper caught on video sitting on top of a black woman beating on her like a punching bag. And now an 18 year old unarmed Michael Brown is shot 6 times and killed in broad daylight in Ferguson, Missouri for reasons still unknown. The common denominator, all the acts were committed at the hands of white men who want to take America back? Brings back memories of Emmitt Till! Chicago, New York, St. Louis, LA, Baltimore, Detroit, DC, Maryland and now Ferguson, a suburb in Missouri have become breeding grounds for brutal and corrupt cops who in the final analyst are nothing but cowards with a badge and gun. They hide behind a Code of Silence! The most organized gangs in America are not “The Crips & Bloods” it is your local police departments. USA Today: Two black men are shot and killed by police every week in America! But in 2009 as U. S. Attorney for United States of America in President Barak Obama’s administration I heard and saw a different Eric Holder. In a speech during Black History Month at the Justice Department he declared, “Americans wrongly consider the United States a melting pot. In things racial, we have always been and I believe continue to be, in too many ways, essentially a nation of cowards.” It took a whole lot of balls to make that statement as a black man and politician, but it was the whole truth and nothing but the truth. How can people who call themselves human beings allow an 18 year old to lie in the streets dead for over 4 hours with his parents present and no one in authority is sensitive enough to try comfort them? One of my favorite television shows to watch on the weekends is “Animal Planet” and it is times like this I am left wondering, who are the Real Animals? The problem, he and his Republican counterparts across the aisle have is they never have been black and have never spend any significant time in the war zones of our inner-cities and therefore have become a part of the problem. Police shootings and hanging of black men and black on black murder have become the norm in America replacing Apple Pie. Why is it that the media and others with hidden agendas want to make a point that “Outsiders” are responsible for the violence in Ferguson? They evidently think that American citizens don’t have a stake in this charade? Have they forgotten Selma and the march on Washington where outsiders could be seen as far as the eye could see and made a difference—where is the beef? Where and when will this madness end? I once thought in my life time—I now have serious doubts! “Hands up Black Men in America”—Fairness not on my watch. Hey Buddy!, I found this information for you: "ERIC HOLDER GUARANTEES FAIRNESS IN FERGUSON WHERE NOBODY PLAYS FAIR". 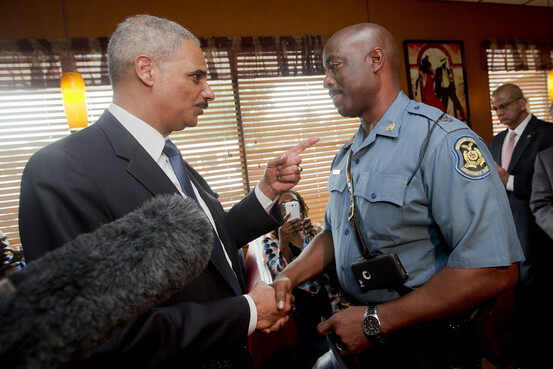 Here is the website link: https://blackmeninamerica.com/eric-holder-guarantees-fairness-in-ferguson-where-nobody-plays-fair/. Thank you.